"Root Beer Rag" is fast, rollicking, modern rag. Ragtime music enjoyed a short resurgence after the success of the movie "The Sting" (1973) and its soundtrack featuring the ragtime music of Scott Joplin and others. Naturally, the piano man had to take a shot at writing his own ragtime piece. 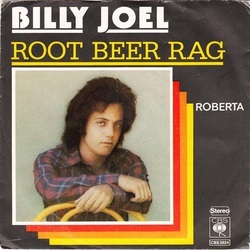 "Root Beer Rag" is an enjoyable, fun piece, allowing Billy to show off his formidable piano skills. It has broken the heart and spirit of aspiring pianists who have tried to emulate Billy Joel, just like the cascading piano solo in "Scenes From An Italian Restaurant." Despite the idiosyncratic nature of the song, it was a fan favorite in concerts during Billy's early years and into the late 1970's. It largely disappeared from his live set in the 1980's until making a re-appearance in the late 2000's. Here is short live recording in 1974 of Billy playing Joplin's "The Entertainer" from YouTube (audio only). Performance of "Root Beer Rag" from 1978 . . .
. . . and a live performance from 2013's New Orleans Jazz Fest. Billy discusses and plays "Root Beer Rag" on SiriusXM in 2016.